With Marc Gunn‘s Irish & Celtic Podcast running in my iPod, I begin another story of tracing my roots. I grew up always believing I was solidly Scottish on my mother’s side of the family. Then as my peer generation grew older rumors of Irish countrymen mixed into the discussion. I had to know more. I found in researching this topic that King James, in his attempt to tame Northern Ireland, wanted a large contingency of Protestants to settle in Ulster and the surrounding Provinces during a 90 year period from 1607-1697. The English wouldn’t bite at his suggestion, but about 100,000 Scots, mostly Lowland Scots, eagerly left their declining farmland for promised rich land across the 12 mile North Channel. In my ancestors’ case, they settled to the county of Armagh in the Province of Ulster. The Highland Scots were not encouraged to migrate due to their supposed unruliness and King James didn’t want them mixing in with the primitive Irish who could not speak English and who were currently not making a very successful go at living off the land. In other words, farming was not turning a profit; King James wanted to turn this around. With the emigration of the Scots into the North, within a 100 years the economy slowly prospered. But unfair decisions over time by the English government in relation to the agricultural economy and religious problems, prompted another mass migration of the Scots out of Ireland in the early 1700’s to the American Colonies. 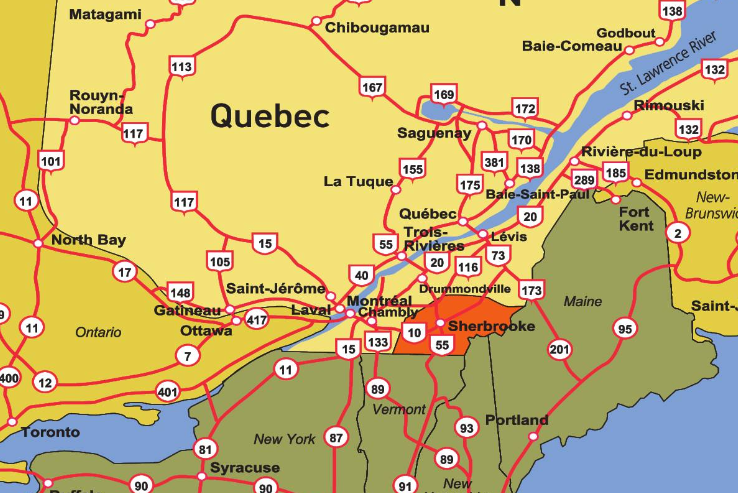 My relatives didn’t leave until 1830’s, after the Potato Famine, and not to America, but to the Eastern Townships of the Providence of Quebec. In 2001 , we were off as soon as the school bus hit the street with the screaming kids anxious for the sweet days of summer vacation. We headed out with our suburban and 24 foot travel trailer. Our friends, Howard and Betsy MacGirr followed in their truck and travel trailer, we looked like a gypsy caravan. Howard, with the surname of MacGirr had very Scottish roots, and had always had the dream of traveling through Canada to Nova Scotia. His health was in decline and this trip was very important to him in spite of the discomfort of long hours of riding. When we stopped, he would happily head for his trailer and sit back in the special recliner that was waiting for him. My boys were quite fascinated with the fact that the front of the MacGirr mobile home looked like a real living room with matching recliners, a big TV, and roomy kitchenette. Our trailer, on the other hand, had bunks and a bathroom in the back, a kitchenette with benches and table that made into a double bed, and a couch which pulled out into a longer roomier bed, not quite as homey as the MacGirr’s abode. Traveling in tandem made it handy to take turns sharing entire or parts of meals, usually supper . It made our adventure together very family-like. When I drove, Cam navigated and would search for our next camping site. We were not prepared for the moment when we passed from Ontario into Quebec. Suddenly the road signs were in French and we had no clue. We did have a compass in the truck. When one had to make a decision about a cardinal direction which were now nord-est sud-ouest we had to quickly figured out the English translation and continue without causing a traffic jam or accident. The problems became more pronounced once we hit Montreal. We had the challenge of figuring out how to cross the Montreal River, which we did several times. This was due to wrong turns and ending up in turning lanes that cross back over, again and again. I remember once deciding to try a different route and turned into a narrow passage that came up out on a bridge that appeared much like a train tressel. I scream and hit the brakes with the MacGirrs almost rear ending us from behind. We quickly decided that this WAS NOT for trains as it first appeared and we were not heading for our immediate death by being hit head on by a steaming locomotive. Whew! I also remember many tight turns in the older parts of Montreal as we tried to find our way out of the city and south across the river. I believe we turned a lot of heads with our “American” ignorance. We eventually found our way out of the city and onto the correct road that would take us to our campground. 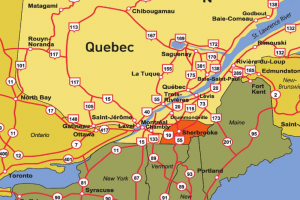 That night I excitedly plotted out the next day’s journey which would take us into southern Quebec and the homeland of my Scottish ancestors. I had my camera ready and the map marked for the villages I wanted to photograph. 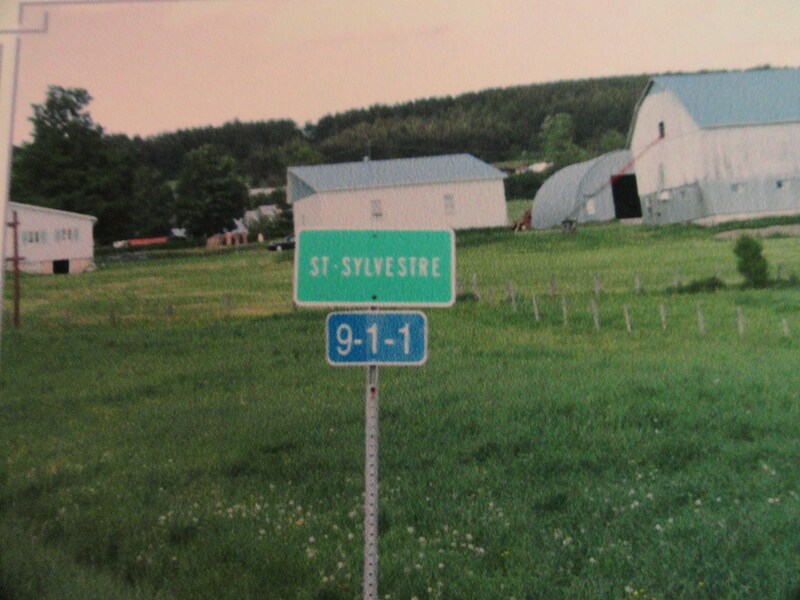 By noon the next day we reached Ste.Sylvestre, close to the settlement of the Orr clan. They actually first settled in Armagh near Inverness and St. Patricks. 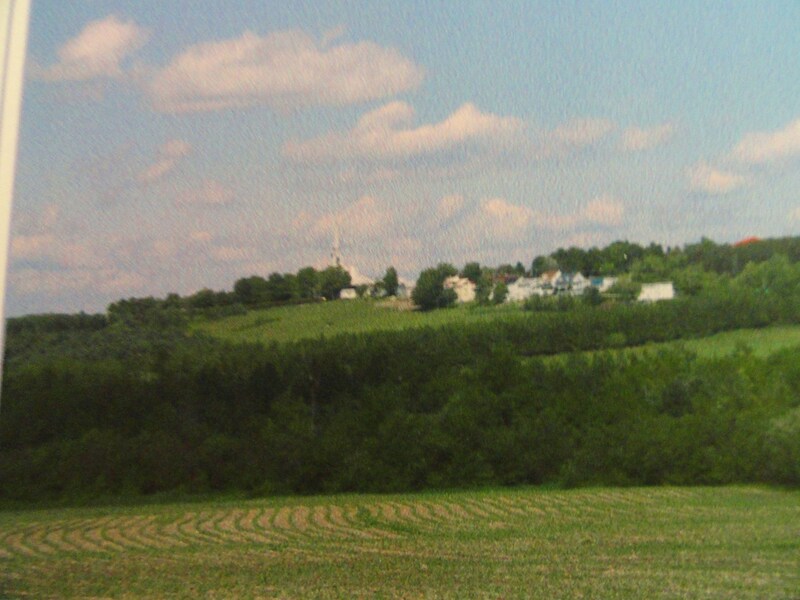 After traveling through rolling farm land and quaint picturesque villages, much like you would find in Vermont, we found the village perched upon a hill. 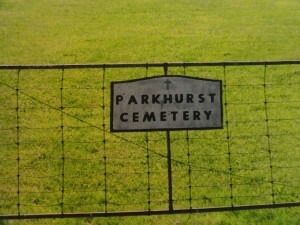 We drove around the small town quickly, and then stopped to ask directions to the Parkhurst Cemetery. To my surprise in this Eastern Township region, formerly English speaking, that very few adults in this remote village spoke English or else did not wish to. But a clerk in a grocery somehow directed to me to an older gentleman on the west end of town, that he might know about what I was looking for. 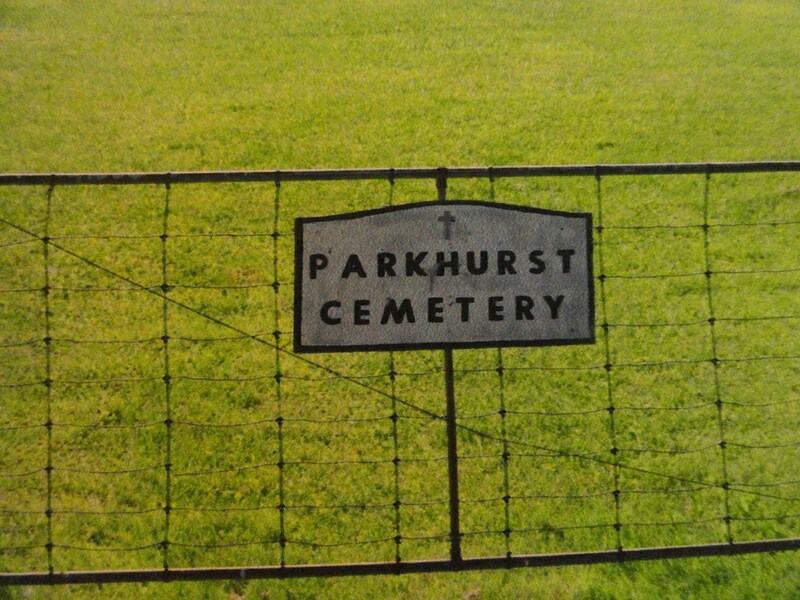 We found him, he could speak broken English, but did not know where the Parkhurst Cemetery was. He sent us off down the road and then north to the village clerk’s office, which looked like a church. Actually the upper part of the building was a church and the basement housed the area’s records. We found a very friendly clerk, but she could not speak English either, it seemed to be the trend. I borrowed her pen and wrote down the Cemetery’s name, for which she recognized and then gave me directions in French. That was not working for me, so I pointed to her pen and paper indicating for her to draw me a quick little map. She understood that and did so. Bingo! We were off again on this treasure hunt of an adventure and within 10 min reached the simple cemetery where several of the 1st Orr relatives were buried. The matriarch of the clan, Matilda Orr, who alone brought her mostly grown-up children to North America, was in the center with a very majestic and new monument. I later found out that either the PA or Vermont cousins had replaced her old headstone, which was nearly unreadable with a new marble or granite 6 ‘ tower- like structure . 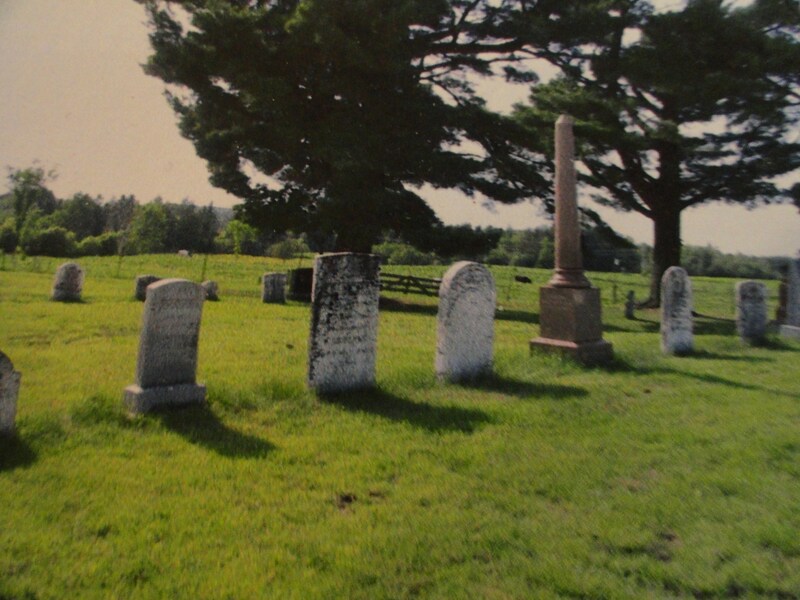 I recognized a few of the names on the surrounding headstones from my family tree research. We walked among the eroding stones. I had wanted my children to try a few rubbings, but when I saw the condition of them I decided against it. I took several pictures. That would have to do. The Methodist Church across the road which was built by the Orrs was long gone. I tried to get into the moment of what it might have been like to live in this area: rolling hills to the north and to the south as far as the eye could see and farms one after the other. 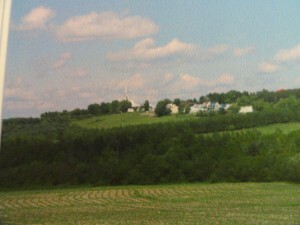 There was not much to see structurally, like a farm house or actually meet relatives, but we were driving through some of the most beautiful pastoral country in Quebec. It would make a lasting impression of its beautiful green hillsides and panoramic views from each hilltop. I pondered the the family stories which tell of Matilda, a widow, and her ten children, 7 sons and 3 daughters and their children who sailed from a seaside port in County Down and were 17 weeks at sea. It is said that the Captain of their sailing vessel got drunk and the crew mutinied, so one of Matilda’s sons who had sailing experience guided the vessel safely into Quebec City. This information apparently has a primary source to verify this with a thank you letter and a watch to the son that saved the day from the shipping company. On the other hand, there is another story about that same trip across the Atlantic in which the crew were worried crazy about a whale following the ship and that one of the Orr’s daughters was thrown overboard as a sacrifice by the crew to satisfy the whale. I know, this sounds like a bit of a tall tale to me, too. What I do know that is true, based on census records, that some of the family were flax farmers in Quebec and several migrated either south or west into the United States. As for the surname, no one is sure of the origin of the name Orr and whether it is D’Or (French) and that the clan came to the British Isles with William the Conqueror or from the last syllable of MacGregor after their defeat by the Campbell Clan. All is likely conjecture. But I do know that they came to North America and they worked hard at whatever they did. So this finally brings me to the end of that part of the great genealogy trip East. There is more, but that is in Nova Scotia and about the Stone/Fordyce side of the family, and another blog.